Conquering My World, One Recipe at a Time. Sometimes, in the middle of the night, when I’m only half awake, I get these ideas for things that I want to bake. Often, by morning, I can’t remember what it was. Sometimes it comes to me again, but other times it is imprinted in my brain to the point of obsession. I openly blame Maria and Katie for my latest episode. I’ve had pumpkin on the brain. And Nutella. And ways to use both. That is Maria’s fault with her Pumpkin Nutella Bread. Then, add on the fact that Katie seems to be eerily reading my mind lately and making it so I don’t have to figure out how to make a Pumpkin White Hot Chocolate to sub for that infamous Pumpkin Spice Latte that I won’t be drinking (no coffee for this girl) and, well, then you can see easily why I have pumpkin on my mind. I had thought I took care of at least the Nutella issue the other day with these little cakes (Visitandine) I made for Dorie’s birthday party, but apparently not. So, these muffins were born. The self-frosting technique isn’t a new one. In fact, thanks to Nic at Baking Bites (who I believe was the first to post Donna Hay’s Self-Frosting Cupcake recipe about five years ago) this idea took the food blogosphere by storm. I felt like it deserved a definite revisit. This recipe came about from some serious tweaking to my favorite Banana Muffin recipe (which, incidentally works with the Nutella on top as well if you aren’t a pumpkin fan). I love this recipe dearly and end up making them about once a week whenever our bananas have outlived their eating out of hand shelf life. And, yes. I usually buy enough bananas to make sure that happens! In a large bowl, whisk together the flour, cinnamon, ginger, nutmeg, sugar, baking powder, baking soda, salt and cocoa powder. Set aside. My goodness, Holly. These are amazing! The self-frosting idea is very enticing. These sounds amazing! And the self-frosting…perfect! Can't wait to give these a try! Okay, this is the first time I've heard of self-frosting cupcakes. Where the heck have I been? Fabulous! Dear Holly I wonder if you can go back to sleep after you create these wonders ! I have a few wating bananas do I just sub the same quantity for pumpkim ? Everything's better with Nutella on top! I totally blame those lovely ladies for my pumpkin addiction as well. My roommate also has a jar of nutella that I've been eying. As soon as she goes out for a while…these shall be made. I think she'll be so enamored with them that she won't even notice that the nutella is missing. Holy toledo…these look super yummy. Gonna have to give them a try! Love it! Happy to be an enabler! wow – these look great! And a fabulous combination of flavours. Pumpin and Nutella sound great together! Now I know what to do with the nutella leftover from my crepes. Genius! Holy cow. Dreamy! And now I'm not sure which to make first–pumpkin or banana. I've got an open can of pumpkin AND ripe bananas. Awesome, Holly. Looks divine!!! Oh, and LOVE your recipe selection in the Wasatch Paper thingy. My Mom found it and gave it to me…we're so proud! Sorry for sounding cheesy…miss you! This post had me at "Nutella". What a clever idea to put pumpkin and nutella together'! These look like unbelievably good muffins. Thank you for the recipe, cannot wait to try!! Oh-M-G… seriously, I am so crazy anxious to make these for the weekend. I'm crazy about pumpkin and have been staring at a jar of Nutella for a few weeks… going blank on what to make. You are awesome… thanks! Oh, and the photos are stellar. Can you believe that I've never made any self-frosting anythings?? I definitely need to remedy that – with these muffins! What a great idea! Thanks so much, and it sounds much easier than I was expecting it to be. Thank you!! I just found your site through Dorie's. I was looking for a recipe I would want to make for a church event and your corn soup caught my eye. Then when I read your bio I had to subscribe. I have a son with Down's who is 18. He is a sweetie! 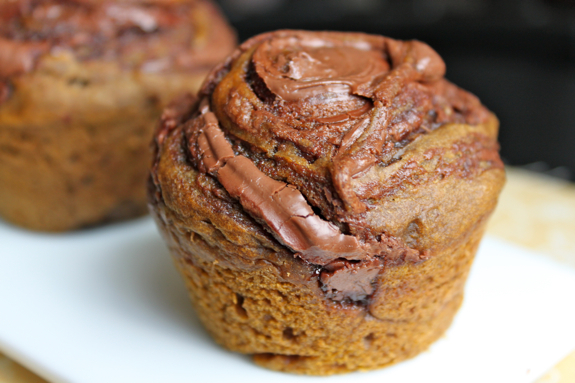 Now I got sidetracked by this Nutella pumpkin recipe. Oh my, can't wait to try this! Looking forward to more recipes. OMG i am SO trying these! this is genius!! My love for Nutella runs deeps, I have 2 jars in my cupborad right now. Oh yes I will be making these asap!! Do the pumpkin and nutella go well together? I'm a bit skeptical, but very curious to try this recipe! They go together like peanut butter and jelly, like Bert & Ernie, Laverne and Shirley…. the list could go on but yes pumpkin and nutella together ROCK! It’s interesting because when the Nutella blends with the pumpkin it loses its hazelnut flavor and becomes so chocolately and the texture changes to an almost cakelike tecture. Yum! I am actually baking more on Saturday. I found these via pinterest and made them right away. They are AWESOME! I added chocolate chips. THank you! So…. I baked a dozen of these self frosting cupcakes 2 days ago and they were gone the same day. Yup, that’s how good they were! Thanks for the recipe! Hi! I found this on Pinterest, and made them tonight! They look exactly like yours, and the top part was delicious- LOVE the Nutella swirled in there! So rich and chocolatey. My only question was that the bulk of the muffin came out much more dry than I would like. I baked at 375 for 25 minutes, but I was wondering if there is a way to make these more moist. I am NOT a regular baker, and I have no idea how to adjust the recipe without possibly messing it up. Any ideas? More oil? Add water? How would that affect the baking time and/or temperature? I would LOVE to make these again. Anyone have any tips? La la la la la Those look fabulous! I may actually endanger my winter pre-beach fitness program for these by going forth to the kitchen. That should work just fine. When a recipe says unsweetened cocoa powder it simply means not to get one that has added sugar. Confusingly some stores put their hot cocoa mix right by their baking cocoa. You found the right stuff! Enjoy! Hi Holly, I’m a little behind and just made these tonight! I made 24 muffins out of the batter but wonder of they’re too small… Should only 12 have been made? They’re still delicious but want to check! Thank you for sharing!!! The recipe does make 12 muffins, but 24 muffins sounds good to me… more Nutella to muffin ratio! I just made these and YUM! They are great! My fiance ate two immediately and he doesn’t like a lot of cakes/sweets so that’s saying something! I didn’t add nutmeg and added slightly more salt and cocoa powder (Ghirardelli- yum!). 25 minutes was perfect! I will make these again next week for a fall party. Thanks! I am so excited about this recipe! I made them for a bake sale and was sooo pleased that they are actually really, really good. So many time recipes end up tasting mediocre or looking nothing like the photos. This is a case where that is abxolutely NOT true! My family loved them! 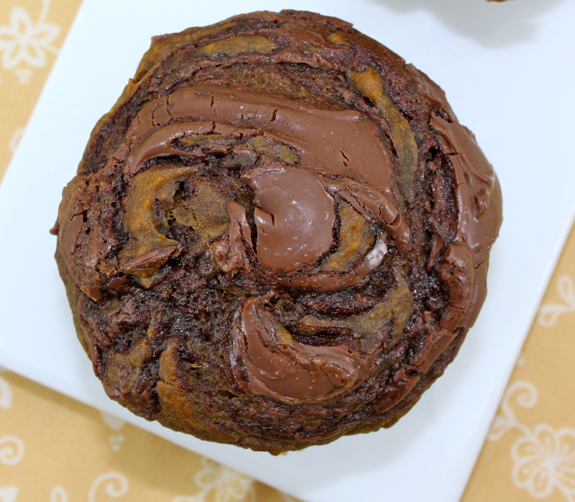 The muffin portion is moist and very delicious, and the Nutella topping looks and tastes great. I made them exactly as the recipe is written, with the exception that I used more Nutella on top than called for (probably more like a tablespoon!) The recipe is also very acurate and make 12 just-right sized muffins. They baked up beautifully–full and rounded and just perfect. Thanks for the great new recipe! Previous post: Dorie’s Virtual Surprise Birthday Party! I'm the Mama to two wild little boys and one very sweet baby girl with Down syndrome. I'm also married to a skydiver/wind tunnel instructor/BASE Jumper. This all makes for an interesting life at our house. So, in an attempt to keep what sanity motherhood and marriage leave me with, I am trying to conquer my world, one recipe at a time. Cheaper than therapy, and much more tasty!